John M. de Castro, Ph.D.
By John M. de Castro, Ph.D.
Trauma leaves in its wake a syndrome of posttraumatic symptoms which can haunt the victims for the rest of their lives. These include persistent recurrent re-experiencing of the traumatic event, including flashbacks and nightmares, loss of interest in life, detachment from other people, increased anxiety and emotional arousal, including outbursts of anger, difficulty concentration, and jumpiness, startling easily. Unfortunately, experiencing trauma is quite common. It has been estimated that over half of adults will experience a significant traumatic event during their lifetime. It’s been estimated that of adolescents, 8% have been exposed to sexual assault, 17% physical assault, and 39% had witnessed violence. This is tragic unto itself, but childhood trauma can continue to affect mental and physical health throughout the individual’s life. How individuals cope with trauma helps determine the effects of the trauma on their mental health. Trying to avoid thinking about or being in touch with internal experiences, experiential avoidance, disallows the individual from confronting the experiences and could exacerbate the negative effects of the trauma. On the other hand, experiencing the feelings and thoughts completely would allow for better coping. This would be provided by mindfulness. Indeed, mindfulness has been found to be effective for relieving trauma symptoms. In today’s Research News article “Effects of Traumatic Experiences on Obsessive-Compulsive and Internalizing Symptoms: The Role of Avoidance and Mindfulness.” (See summary below or view the full text of the study at: https://www.ncbi.nlm.nih.gov/pmc/articles/PMC5654743/ ), Kroska and colleagues investigate the roles of mindfulness and experiential avoidance on psychiatric symptoms of trauma in adolescents. They recruited troubled students from an alternative High School and had them complete measurements of childhood trauma, experiential avoidance, mindfulness, and obsessive-compulsive symptoms. They also recruited college students and had them complete the same measure and additional measures of internalizing, including anxiety and depression. They then performed a statistical analysis of the responses including a mediation analysis. They found that with the troubled youths, experiential avoidance was associated with greater obsessive-compulsive symptoms. They found that childhood trauma was associated with lower levels of mindfulness, while high levels of mindfulness were associated with lower levels of obsessive-compulsive symptoms. Hence, for the troubled youths, experiential avoidance was associated with greater psychiatric symptoms while mindfulness was associated with lower symptoms and that childhood trauma tended to impair mindfulness. With the college students they found that childhood trauma was associated with both greater experiential avoidance and with lower mindfulness, especially the observing facet of mindfulness. In addition, obsessive-compulsive symptoms were associated with higher levels of avoidance and lower levels of mindfulness. In looking at internalizing, anxiety and depression, a similar pattern emerged. 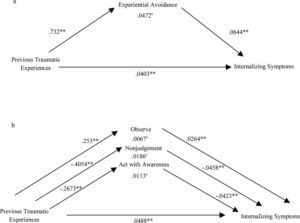 Childhood trauma was associated with both greater experiential avoidance and with lower mindfulness and internalizing symptoms were associated with higher levels of avoidance and lower levels of mindfulness. These results suggest that childhood trauma is associated with higher levels of psychiatric symptoms including both obsessive-compulsive and internalizing symptoms and that these associations of childhood trauma are mediated by higher levels of experiential avoidance and lower levels of mindfulness. This further suggests the nature of the mechanisms for trauma effects on mental health, with trauma acting through increasing avoidance and decreasing mindfulness to impair mental health. These findings may help to improve therapeutic interventions for the treatment of the symptoms of trauma. They suggest that treatments targeted at increasing mindfulness and lowering experiential avoidance would produce great mental health benefits for survivors of childhood trauma. Trauma exposure is associated with adverse psychological outcomes including anxiety, depression, and obsessive-compulsive (OC) symptoms. Adolescence is increasingly recognized as a period of vulnerability for the onset of these types of psychological symptoms. The current study explored the mediating roles of experiential avoidance and mindfulness processes in the association between retrospective reports of childhood trauma and current internalizing and OC symptoms in adolescents. A group of at-risk adolescents (N =51) and a group of college students (N =400) reported on childhood trauma, experiential avoidance, mindfulness, anxiety, depressive, and OC symptoms. Mediation analyses were performed to examine the mechanistic roles of avoidance and mindfulness in the association between trauma and internalizing and OC-specific symptoms. In the group of at-risk adolescents, experiential avoidance and mindfulness both significantly mediated the association between childhood trauma and OC symptoms. 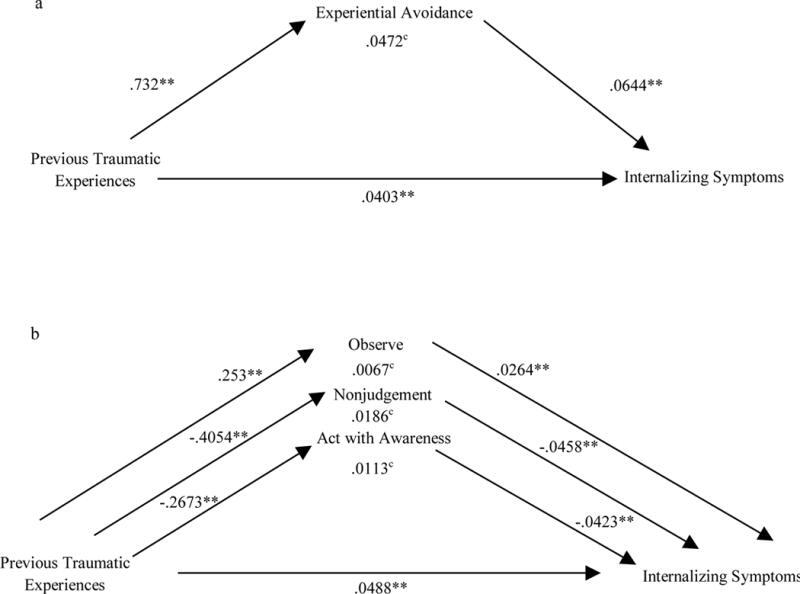 In the college student sample, experiential avoidance mediated the association between trauma and OC symptoms. Experiential avoidance, as well as the observe, act with awareness, and nonjudgmental facets of mindfulness all significantly mediated the association between trauma and internalizing symptoms. The group of at-risk adolescents was small, and the college student group was demographically homogeneous. All data was self-report and cross-sectional. The current study demonstrated that experiential avoidance and mindfulness processes may be the mechanisms through which the association between trauma and obsessive-compulsive and trauma and internalizing symptoms exist in adolescents. These findings provide potential targets for clinical intervention to improve outcomes for adolescents who have experienced trauma.